Howdy y'all! 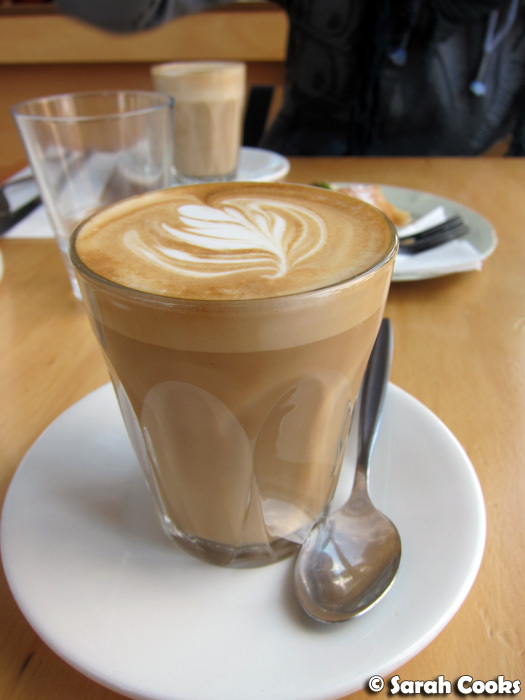 Today I wanted to tell you about my new absolute favouritest cafe in all of Melbourne: Beatrix in North Melbourne. I finally made it to Beatrix a few weeks ago, after months and months of drooling over their Facebook page and Twitter account and reading my Twitter-buddies' enthusiastic tweets about the cafe. We went on a Sunday arvo, loved everything we ate, and promptly rounded up my parents to visit again the next weekend. 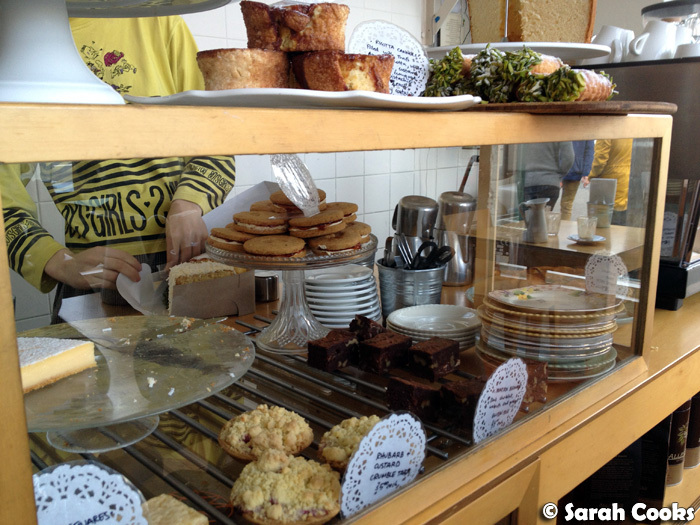 They're a very small cafe, and there's usually been a bit of a wait when I've visited, even at non-peak times, but I've always felt it was worth waiting for. 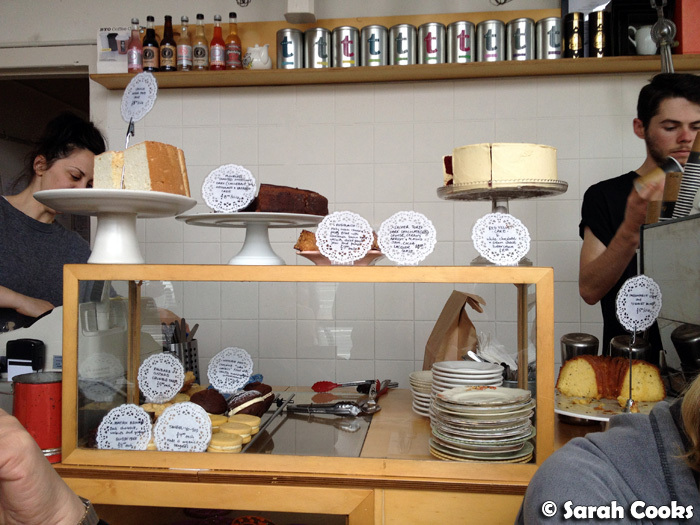 They have a rotating selection of handmade, beautiful old-fashioned cakes, and incredible ciabattas (ciabatte?) with creative and delicious fillings. The staff (especially the lovely owner/boss!) have always been super-friendly and helpful, even when they're full to the brim with customers. Totally love it! Enough words: picture time! I won't be putting too many descriptions after the pictures because, well, how often do you need to read the words "OMG DELICIOUS!!"? Hehehe. How pretty are the cakes? 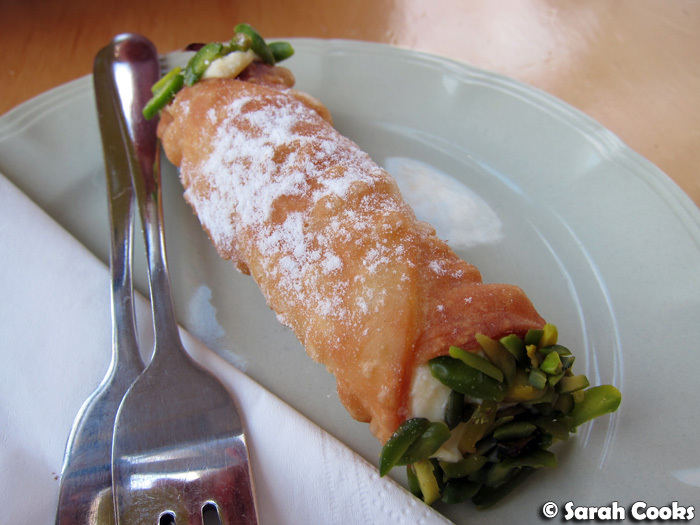 When we arrived and were waiting for a table, I noticed there was only one cannollo left, which made me very anxious - I'd seen the cannolli on Twitter that morning and knew I had to have them! - so I bossily (but politely, I hope) asked if they could keep that for me until a table became free. And they kindly did, so yay! I really liked the crispy pastry (made with love... and lard!) and the smooth ricotta filling. And you know what, about 5 minutes after we sat down, they brought out a whole new tray of fresh cannolli, so I needn't have worried. Oops! 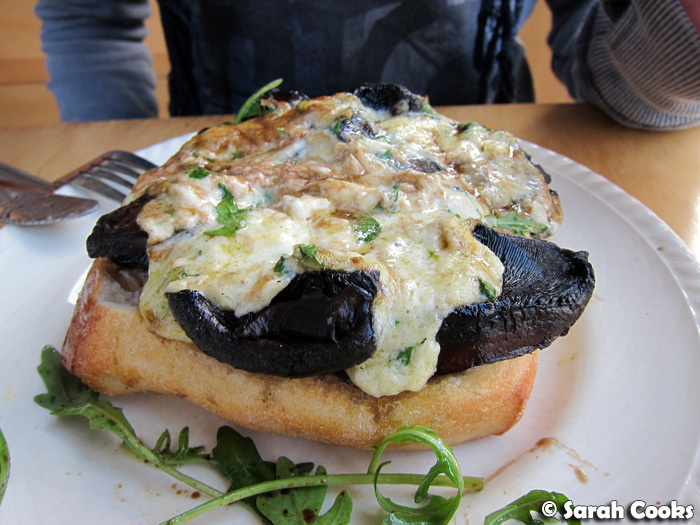 This mushroom toastie was decribed by Sandra as: "the best mushroom dish I've ever had in a cafe, anywhere". High praise indeed! 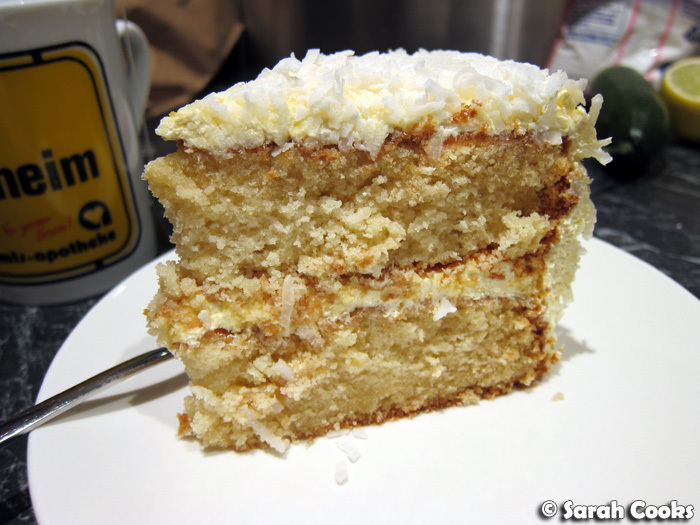 Aaah, just look at those tall layers, full of creamy buttercream goodness and soft coconut shavings - it was an extremely indulgent afternoon tea! 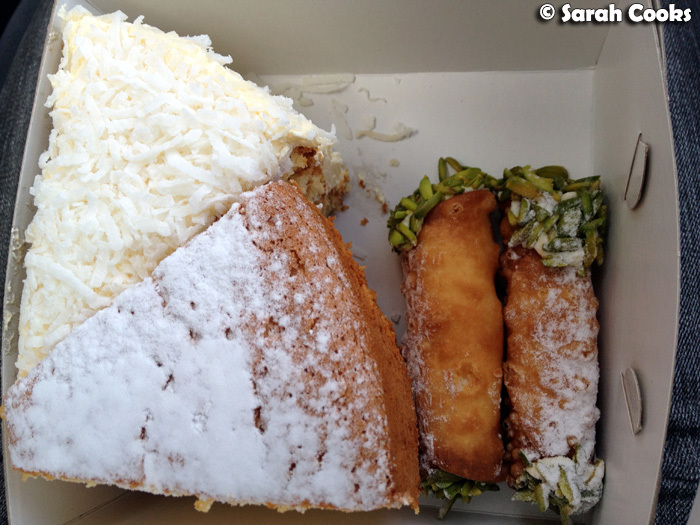 All the sweets were excellent, but I was particularly impressed with the grapefruit chiffon. Look how tall it is! Fluffy heaven! 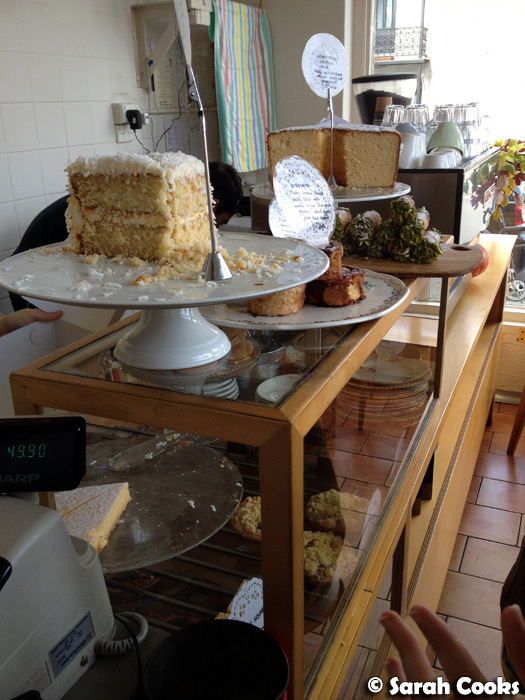 And now some pics from our second visit - we managed to snag the table right in front of the cakes - yay! I always get distracted by the cake display, and seem to ignore the little fridge they have on the other side of the coffee machine with even more tempting treats (e.g. strawberry meringue roulades, lemon tarts and more). Next time I must, must remember to look at the fridge before I get too excited and order loads of sandwiches and cakes! 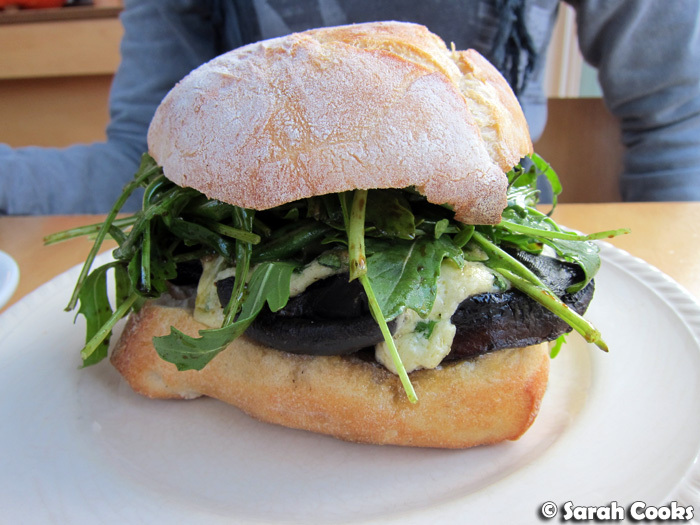 On this visit, both my mum and Sandra had the mushroom toastie (this time it was made with small mushrooms rather than big meaty ones - delicious, but slightly less satisfying), and my dad went for the massive El Guapo! It contained super tender beef, redolent with Mexican spice (I think it was chipotle or ancho, or maybe both! 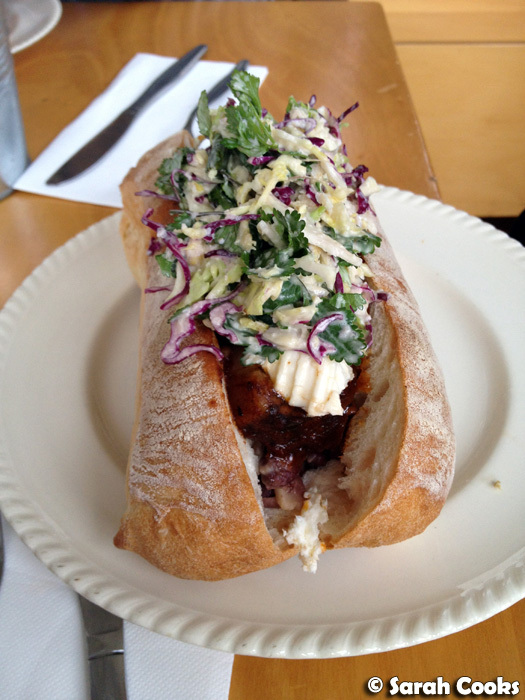 ), some sharp queso fresco and a generous topping of refreshing coleslaw. It was amazingly good! 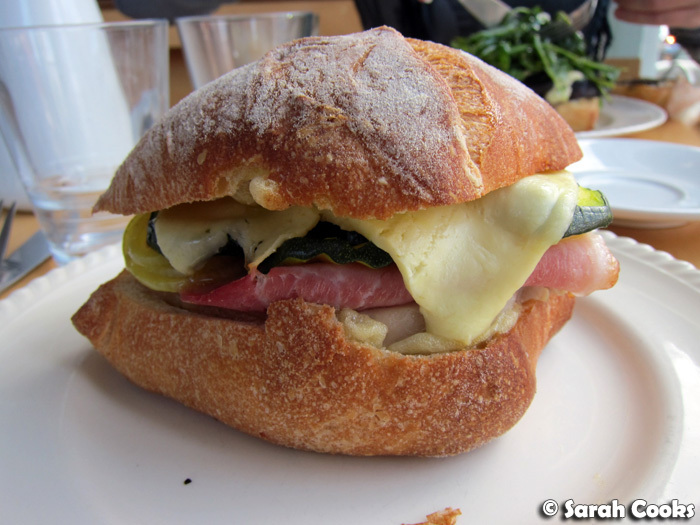 They actually brought one of these out for me by mistake (I'd ordered the veggie offering that day), and after they took it back, I had a bite of my dad's sandwich and regretted sending it back...! Aaah! Total carb overload! I loved it - all freshly fried and hot potato wedges, smothered in garlic aioli and spicy pepper sauce! 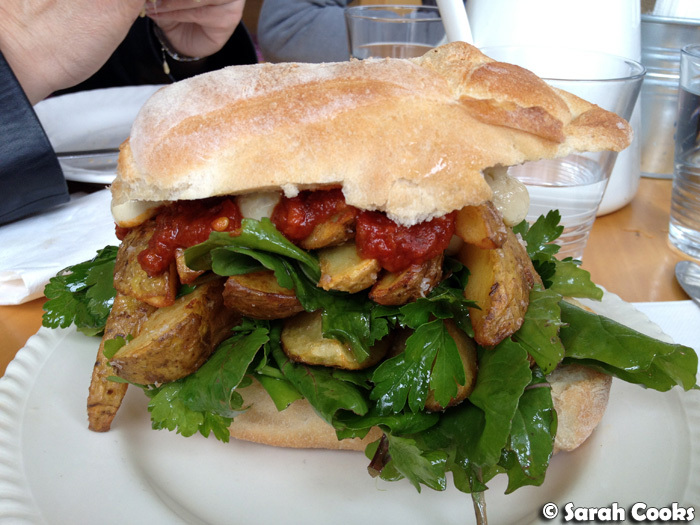 It was too big to eat as a sandwich, so I just lifted the top off and picked at the potatoes, sauce and salad, and ate the bread in dainty (hah!) little bites. My mum ordered the whoopie pie - I'd previously thought whoopie pies were a bit of a waste of time, but this was seriously good. I loved the dark chocolate flavour in the cookie part, and the gorgeously creamy buttercream inside. 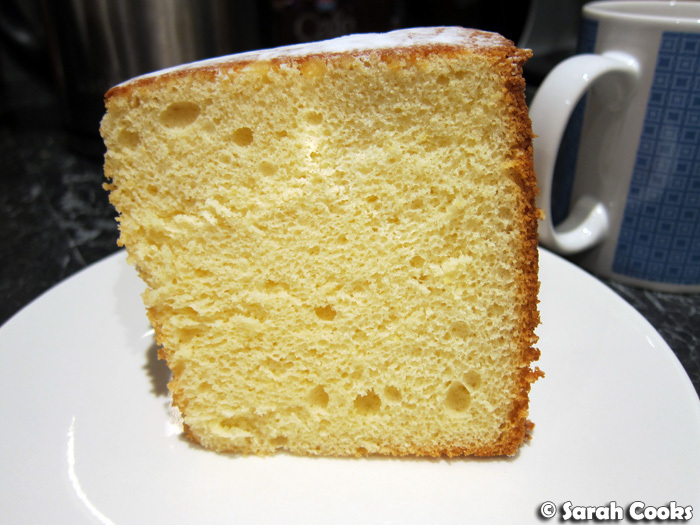 Once thing I've noticed with all their cakes is that they taste "real", as in they're made with high quality ingredients and flavourings, with no artificial essences or anything nasty like that. They also have lovely, well-balanced flavours - they're generously portioned but not overpoweringly rich or sugary. So there you have it: Beatrix is awesome. What are you waiting for? Thank you for great detail! I laughed about your comment about red velvet frosting..agree! I am planning a visit and cake buy up ASAP! May be a 2 hour round trip but that's ok.
Gimme gimme! 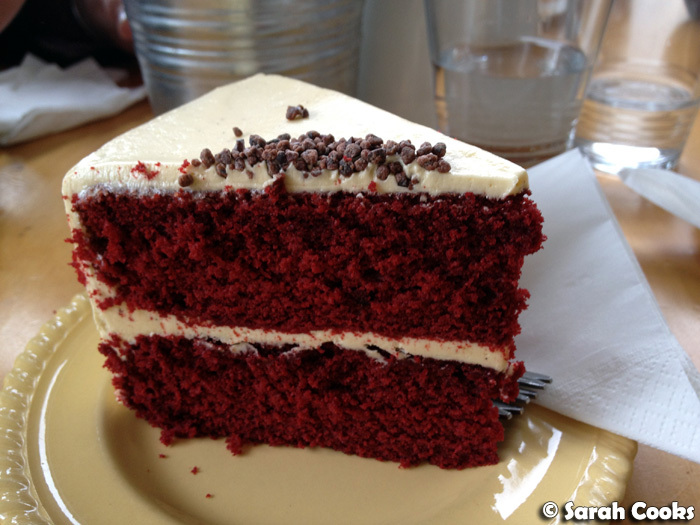 The red velvet cake, the rest of the cakes and those sangas....and those biscuits. Take me there!!! Love love love Beatrix. 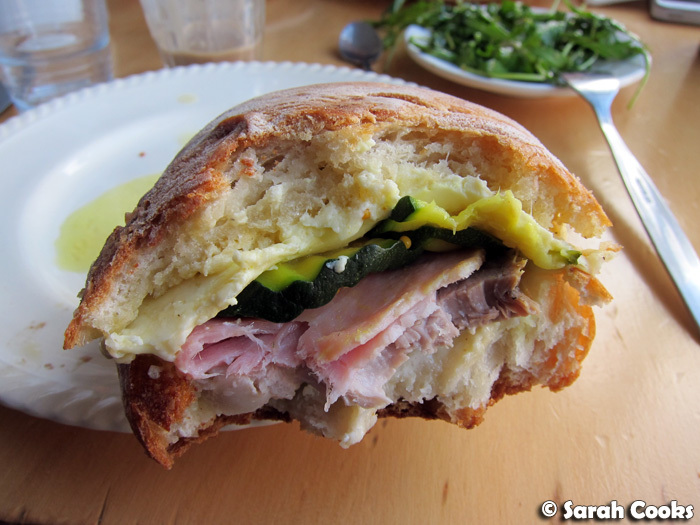 I think the Just Chicken is pretty much the best sandwich I've ever eaten. AND THE RUGELACH! 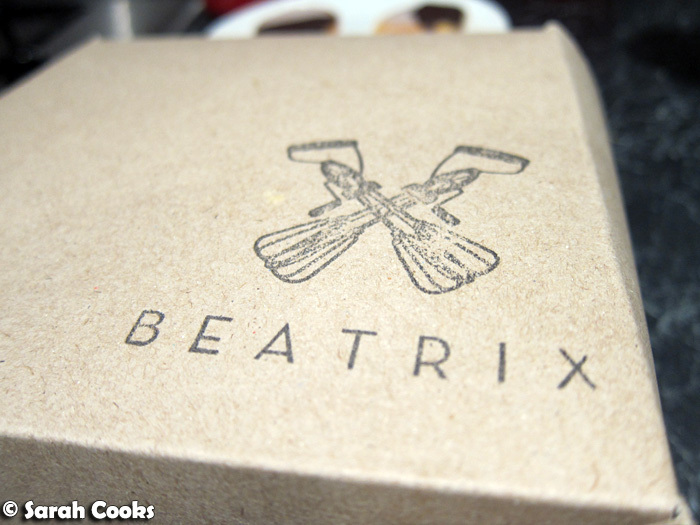 LOVE Beatrix!We reviewed it recently too (after some many visits for those luscious cakes). 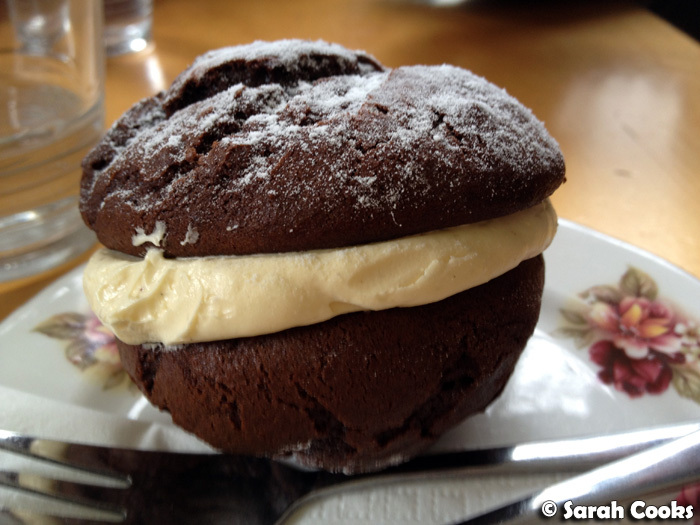 The whoopie pie is probably the best rendition available in Melbourne. This just confirms that I REALLY need to go here.... with an extra stomach!